A fascinating piece on designers selecting “good” design available for under £10. Christmas at our house. 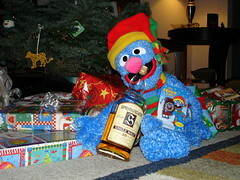 Once again, Grover not only gets out of control, but breaks into the good stuff. I owe a link to Chris, who I met through Harry, for both reading my blog (that is at least one reader, since I don’t read it myself) and for writing about marketing. He is not a “marketer”, but seems to be doing a fine job thinking like one. I also know that Harry is always around to help me with my marketing challenges. He read some book I lent him, so…. The funniest thing about marketing is how easy it seems and how difficult it can be. I am working on a large project right now that is deeply steeped in the fundamentals of brand identity and how to best manifest the brand through various media. The project is very challenging and raises as many issues as it hopes to address. The most interesting part, however, is that this problem is always difficult. This is not the first time I have faced this particular business challenge, and won’t be the last. Each time, it is equally tough. The ability to create a brand identity that stands the test of time and the test of the market is a very monumental task. Failure happens more often than success, unfortunately. As the project moves along and becomes public I will share my thoughts about how we got to where we are going. I am taking time off for the holiday season right now, and as much as I like blogging frequently I am also trying to minimize my “keyboard time” for the next couple of weeks. Please have a safe and happy New Year. Thanks to my team mates Ed and Richard for passing this on. They know how important it is to me to keep up on the King. You are currently browsing the Thinktone blog archives for December, 2004.